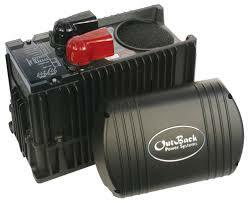 OutBack Inverter/Chargers are the next generation in advanced power management. Each is a DC to AC sine wave inverter, battery charger and AC transfer switch housed within a tough die-cast aluminium chassis. Just like the local utility grid, the inverter produces true sine wave AC electricity for your stand-alone or backup power needs.